We love to keep our blog informative and full of useful information for wherever our patients (or would be patients) are in their hair restoration journey. But we also like to have a bit of fun with it and make our readers aware that hair transplant procedures really are quite normal in today’s world. So in this post, we’re going to look at the cricketers that have had hair transplants – because there are so many of them! 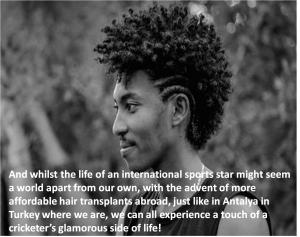 And whilst the life of an international sports star might seem a world apart from our own, with the advent of more affordable hair transplants abroad, just like in Antalya in Turkey where we are, we can all experience a touch of a cricketer’s glamorous side of life! As to why there are so many cricketers specifically with hair transplants, who can say? 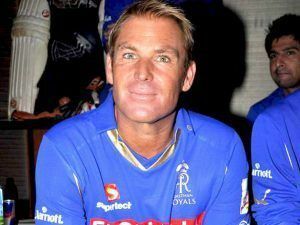 One of the most famous Australian cricketers, and one of the most famous sports stars with a hair transplant, Shane Warne has always been very open about his hair loss. He’s quoted as saying that it was a simple decision, for him, he just didn’t want to go bald. As soon as he started to lose his hair, he sought treatment in 2006. Stories vary on ‘Warnies’ hair restoration. It’s been said that he’s used special combs, stem cell therapy and had laser treatments. But as the best option for restoring hair loss is a hair transplant, Shane has combined laser and other treatments with a number of hair transplants in his native Australia. He’s an ambassador for the procedure and wants to make it as accessible as possible. He’s also said that the pressure of the cameras highlighting his balding scalp in a close up as he bowled made him think about treatment. So that could go some way to explaining why so many cricketers go down the hair transplant route. (And why not, we say.) Either that, or the Aussie cricketing legend is a global hair transplant trend setter! Another well-known British cricketer who’s been under the hair surgeon’s knife is Graham Gooch. 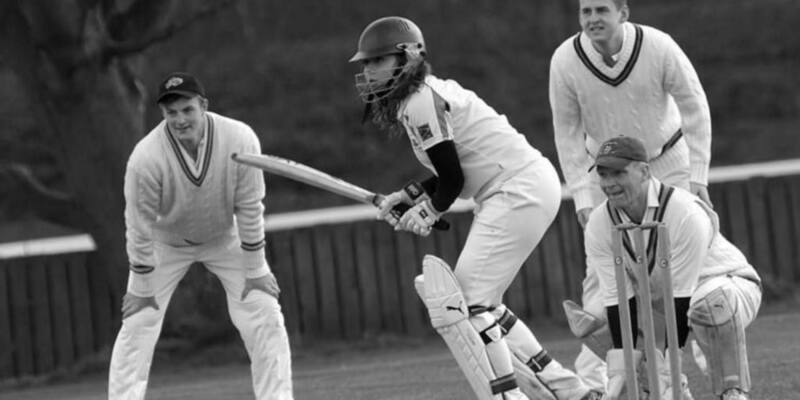 He was famed for using a very heavy bat, and his name is now in the cricket world hall of fame for his batting skills. Graham suffered classic male pattern baldness with his bald patch spreading from the front of his hair line backwards towards the crown. Not only famous for his batting skills, Graham was infamous for his bushy moustache back in the day. And we’re pleased to say that although the hairy top lip is a thing of the past (and probably best left in the 1980s anyway) his new hair is just as thick and luscious! 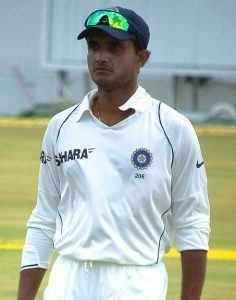 Sourav is a retired Indian cricketer who batting was so good, he became captain of the national team. 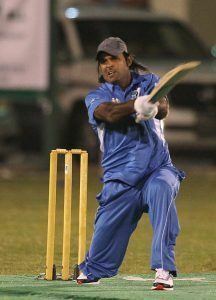 He is nicknamed Dada and is well respected as a national sporting hero. So much so that’s he’s now the President of the Cricket Association of Bengal. It’s widely accepted that Dada has had a hair transplant, and more often than not, commentary on him in his cricket playing days focused a lot of attention on his new hair. It was often described as thick and full of volume, which is everything you want from a surgical hair procedure! 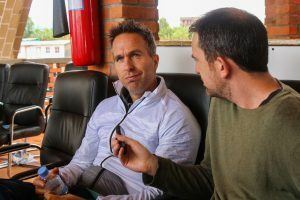 English cricketer Michael Vaughan is rumoured to have had a different procedure from a hair transplant. It’s said by some that he opted for a “strand by strand” hair restoration procedure which is similar to hair extensions. Short hair is individually woven into existing hair to cover up thinning patches. Whilst this procedure isn’t permanent and given that a hair transplant is the most permanent option to cover up baldness, the jury is still out over what treatment Michael has had. And as we’re here to say that a hair transplant is noting to worry about, or to be embarrassed about, we say there’s never any need to be shy! Pakistani cricketing all rounder Rana Naved ul Hasan had an extremely receding hair line before opting to have the hair transplant that completely transformed his look. Before his hair transplant, Rana used to keep what hair he did have around the back and sides of his head cropped very close to his scalp. This is common among many men with male pattern baldness, as it blurs the line somewhat between where hair is present and where hair is absent. After his hair transplant, Rana achieved a full head of thick, wavy hair that looks totally natural and youthful. Renowned as one of the best all rounders in the world, South African Jacques Kallis has also undergone hair restoration procedures. The internet is undecided whether he had the strand by strand weave procedure thought to have been favoured by Michael Vaughn, or a full on hair transplant. But either way, the transformation was so dramatic that he looked decades younger afterwards. He’s quoted as saying that his girlfriend couldn’t think of him before the treatment as it looked so good, and that he felt much younger and more confident. 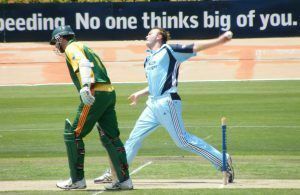 Known as Doug the Rug, Doug Bollinger is a former Australian pace bowler. Like Pakistani cricketing legend Rana Naved ul Hasan, Doug kept what little hair he had cropped short, giving the impression of a completely shaved head. Although he did always sport a very healthy looking, long bushy beard at the same time! Once he opted for corrective hair restoration surgery, he was able to grow a natural head of blonde hair which he now wears in funky, modern spiky styles. Since growing hair on his head, we notice he’s ditched the bushy beard – maybe he can’t handle having so much hair to deal with! 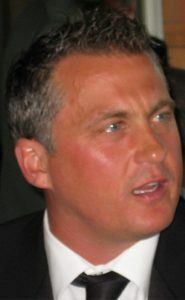 UK cricketer Darren Gough is as known for his test cricket career as much as his hair line. As well as his twinkle toes, after appearing in, and winning, Strictly Come Dancing. Known as Dazzler, he’s been quoted as using Shane Warne as his hair inspiration. 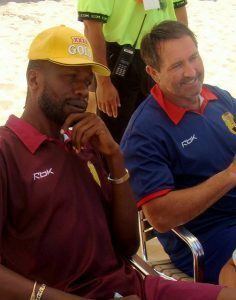 He said, “I knew Warnie had done something about his hair loss problem and he looks amazing now, and he’s older than me”. Like Shane, Darren is very open about his procedures and his hair line now looks totally naturally, and very full. And despite him being very honest about having had hair surgery, Darren also says that his final result now looks completely undetectable. He’s said in public that his experience was seamless, pain free and over in a day with a simple local anaesthetic.